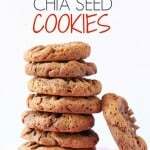 Make delicious and healthy Chocolate Chia Seed Cookies with just 4 simple ingredients! Preheat the oven to 350F / 180C. Line a cookie sheet with parchment paper. Add all the ingredients to a bowl and mix well. Roll the cookie dough into approximately 12 golf ball sized balls and place on the cookie sheet. Flatten with a fork and bake for 10 minutes or until the edges are just starting to crisp. Remove from the oven and allow the cookies to cool. The cookies will keep in an airtight container for 48 hours.